Which Super Bowl loss in the Brady/Belichick era was more disappointing? 1. Which Super Bowl loss in the Brady/Belichick era was more disappointing? Not including XLII because that's obviously the most. LII has recency bias, but the Butler benching is still a bit frustrating. XLVI was at least am evenly fought game where NYG just made a couple more plays than we did. I honestly think we would have won LII if Butler played. I think LII is more disappointing because that was for No. 6, and because of how well Brady played. Dont forget Cooks got knocked out of that game too. Nothing is worse than the first loss to the Giants in the Super Bowl. Next closest ones that hurt me were the divisional round loss to the Broncos because of the way they played and then the loss in the AFC Championship to the Colts. All three of these losses happened in consecutive years too. Head-to-head, this last one was worse. But the Giants pt. II gets my vote here because it would’ve been nice to get one over NYG after 07/08. NYG:P2. Really wanted some payback. This one, we already had #5 so everything beyond was just gonna be frosting on that giant cake of a career. I'd really love to see Brady win a SB by blowout and drop the mic before retiring though. Yeah I would say the Giants one because of the revenge factor and seeing goddamn Eli winning a second Super Bowl. But all things equal LII was way more disappointing considering the talent of last year's team and how well the offense played. 2011 team talent wise didn't belong in the Super Bowl. XLVI. Because of the New York - Boston rivalry, and the vengeance factor. Given how LI turned out, I wasn’t as upset about LII because I figured the football gods might want repayment on the comeback. 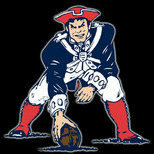 Hopefully the Pats can get it back this year. Preferably by a 68-0 score. That would be nice.